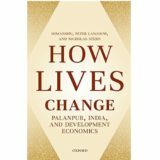 With economic liberalization, several new actors have emerged in Indian cities. Earlier, actors like international consultants, financial institutions and foreign architects were largely absent from decision-making processes that influenced urban development. Others, like politicians, developers, landowners and civil society groups are reinventing themselves to adapt to and take advantage of a rapidly transforming urban environment. Building on primary and secondary data collected in India, this paper examines the role that existing and emerging stakeholders play in urban development in post-liberalization India, and the alliances they form to promote a common agenda. These alliances have their roots in largely informal personal social networks and function mainly on the basis of such connections. This talk will focus on coalitions in Bengaluru, Karnataka in the form of taskforces that were set up by consecutive state governments to advise on urban policy, viz. the Bangalore Agenda Task Force (BATF) in 1999, that has since been dissolved and the Agenda for Bangalore Infrastructure Development (ABIDe) in 2008. These groups have no formal standing in government and yet have been given considerable power especially in the creation of urban policy that would transform the structure and approach of city government. The argument is that increasingly, it is such coalitions are shaping Indian cities and not the institutional frameworks that have been and are being set up by politicians, corporate leaders and civil society organizations. Neha Sami is faculty at the Indian Institute for Human Settlements in Bengaluru, India. She studies the urban politics of real estate development and governance in post-liberalization India. Her previous research focused on the political economy of land and governance under conditions of globalization. She is currently studying industrial corridor development projects between Indian cities like the Delhi-Mumbai Industrial Corridor. She is also interested in the politics of implementation of urban environmental plans, particularly climate change action plans, in Indian cities and on questions of environmental governance. She holds a Ph.D. in Urban Planning from the University of Michigan, a Master’s degree in Environmental Management from the Yale School of Forestry and Environmental Studies and a Bachelor’s degree in Economics from St. Xavier’s College, Mumbai.